Kylie – LE 800 Kylie length – 20,5″ and uses size 22mm eyes. Her head circumference is 14,5″ She comes with 3/4 arms and full legs, cloth body and LE certificate. These arms were actually sculpted for her, but I used them for Jola. Jade is a smiling sleeper vinyl kit LE 700 Worldwide. Jade makes a 21/22″ doll, with 3/4 arms and full legs and comes with a cloth body and LE Certificate. Prototypes reborned by Cheryl van Pletzen and African baby by Jodie Lombardo. Rainer vinyl kit LE 650 Worldwide. 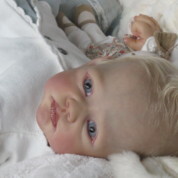 Rainer makes a 21″ doll, with 3/4 arms and full legs and comes with a cloth body and LE Certificate. She uses size 22mm eyes. Prototypes reborned by Cheryl van Pletzen and Tanisha Crockett. This edition is sold out. Lila vinyl kit LE 600 Worldwide. Lila makes a 23″ doll, with 3/4 arms and full legs and comes with a cloth body and LE Certificate. She uses size 22/24mm eyes. Prototypes reborned by Melissa George and Jodie Lombardo. This edition is sold out.